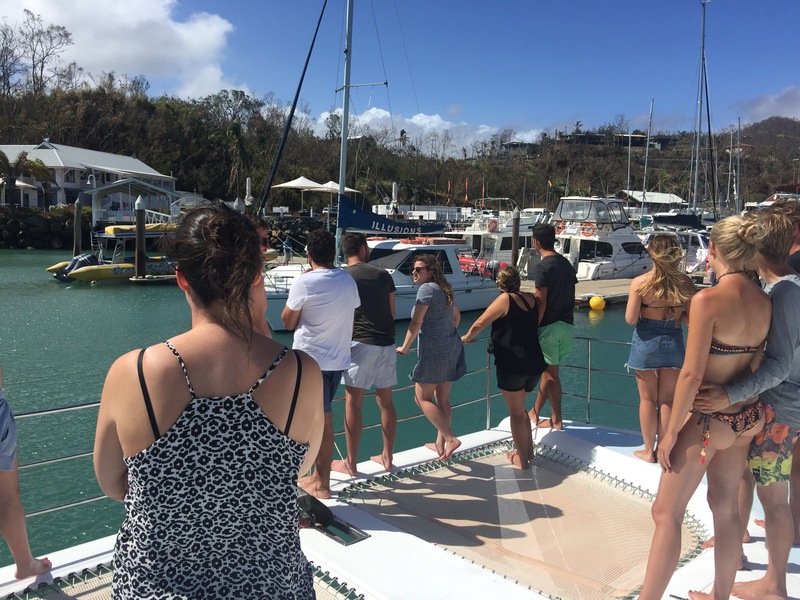 After days of not knowing whether we’d make it to Airlie Beach and the Whitsundays and mentally preparing for entering a disaster zone, the time had finally arrived to set sail. The walk from our hotel to the Abell Point Marina gave us a further hint at the devastation, the start of the boardwalk blocked by fallen trees and further down entirely missing in sections. We were the first to arrive at the marina and there were fortunately signs of things returning to normality – the general store was doing a roaring trade in maintenance and ship parts. In the harbour itself we could see our crew working on the Powerplay but it was clear other vessels had not been so lucky – all that could be seen of the ‘Silent Night’ was her mast sticking above the waterline, while large sections of pontoon were missing and several boats listed at various angles. We were soon joined by our fellow ship mates for the next two days – all in good spirits and like us all were unsure just a day ago if they’d be sailing or not. We were soon joined on the mariner by Luke and Nora our ‘hosts’ for the sail – who along with the formalities also gave us an overview on what had happened to the Powerplay during Cyclone Debbie. 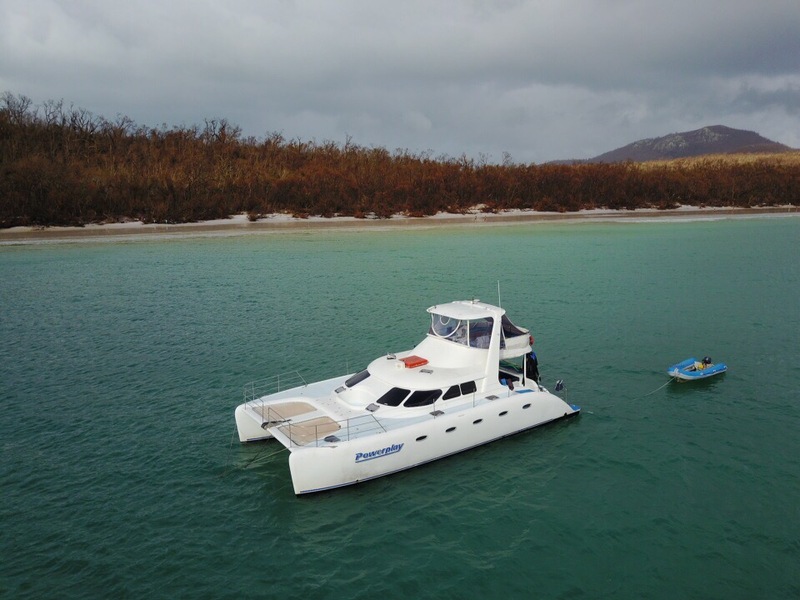 You have to give credit to the crew that the boat was ready to go it just six days after a cyclone – when they’d returned to the vessel immediately after the storm she’d been partially submerged which had flooded two of the three generators on board. The result was that many of the ‘niceties’ on the voyage such as aircon, hot tub, stereos and navigation equipment were no longer working. It was also clear that the marketing pitch ‘we’re open for business’ was largely untested – the boat was running but no one had been out yet to see the islands and reef locations and all scuba diving was cancelled. 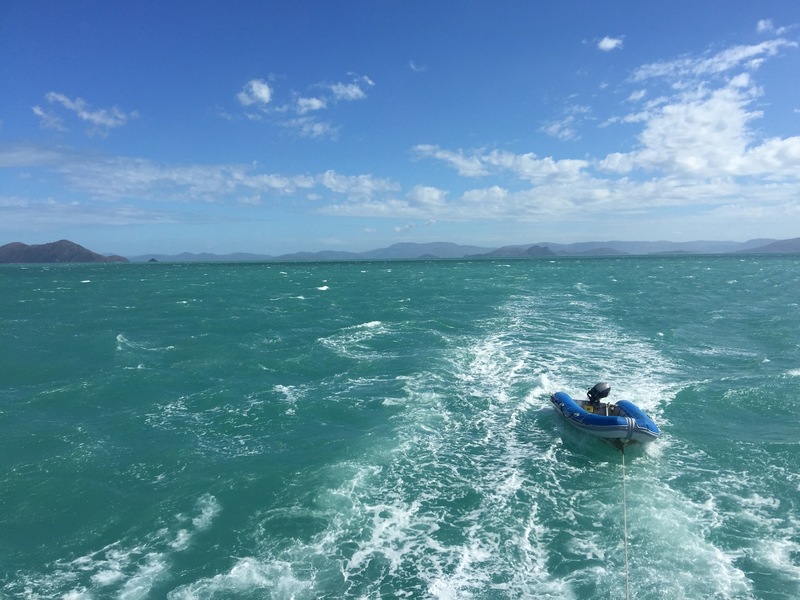 Whilst we’d made it to the Whitsundays – our trip was clearly not going to be quite what we expected or paid for. We pulled out of Airlie Beach under baking sunshine and hit the open seas. We chose a prime position up front, being soaked by the waves crashing across the bow as we bounced from swell to swell. Getting soaked with strangers is a great way to bond and it was clear that we’d been very lucky to get a great bunch of fellow travellers onboard. Our first few stops were ‘sail-bys’ of some of the worst hit island resorts – Day Dream island looked devastated and anything but a day dream with trees down, windows smashed and a sorry looking Kangaroo sheltering under the wreck of a building. We continued on out past island after island stripped bare of trees and foliage – many looked like they had been devastated by fire such was the extent of the dark brown waste land in front of us. As with the islands, Reef after Reef we pulled up on was gone or so silted that it wasn’t worth snorkelling on. As the late afternoon drew in we pulled into Turtle Bay, an area where apparently 10-15 boats usually anchor for the night but we were the only ones. As we pulled in we were greeted by multiple sightings of turtles, popping their heads above the service for a few seconds before diving under. Once photos were taken it was time to launch the paddle boards and attempt some water sports. Whilst a couple in the group mastered various techniques on knees and even a few standing, the two of us kept up a circus act, never quite managing more than one person stood up. Sunset meant time to dry off, crack open some wine and enjoy the feast of BBQ chicken and salads prepared by our hosts while getting to know our fellow travellers better. With an early start the next morning and several people heading to bed before 9pm the fun soon faded and we clambered into our make shift beds in the main dining room cabin. We were prepared for a hot sweaty night but slept reasonably well until woken by an early morning rain shower than poured through the open hatch and momentarily soaked us. 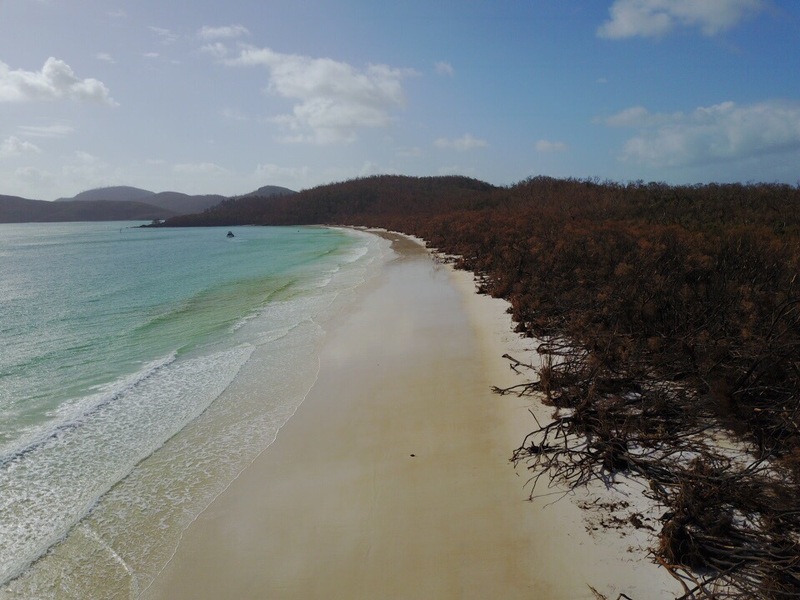 After such a sudden awakening it was impossible to get back to sleep so we sat up for breakfast before we set sail for Whitehaven Beach – one of the five best beaches in the world. Alas it was soon evident that Debbie had done her worst. The usually pristine white sand beaches were littered with debris and downed trees, while island bore all the scars of a natural disaster. We managed to snap some drone footage of the area and walk the beach playing various ball games before the heavens opened. Debbie had clearly not had enough and we were caught on the beach in driving stinging rain before eventually being retrieved to the Powerplay. After lunch we headed out in search of snorkel grounds but for the most part all were gone and the water based activities were simply a way to pass the time. 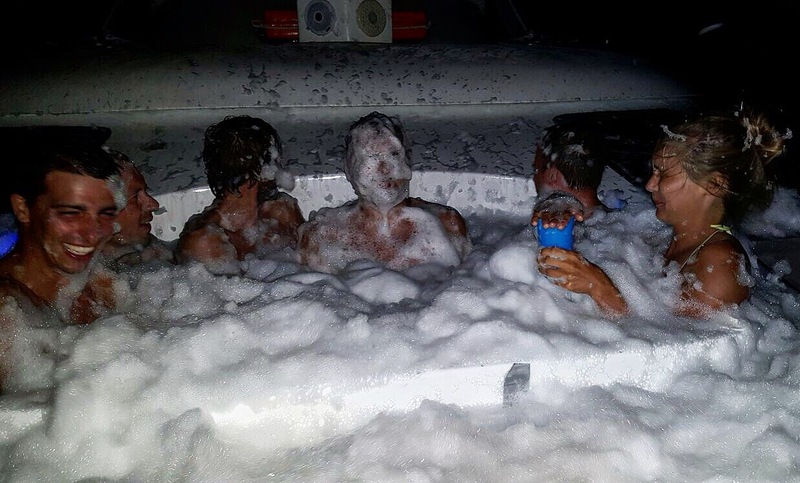 As evening set the hosts, seemingly conscious of the disappointment the group felt tried their best to raise spirits – filling the broken hot tub manually with kettle fulls of water. The improvised attempt along with a liberal helping of dishwashing liquid for bubbles and vodka and goon meant a good time was had – and best of all we managed to clean off after two days covered in salt. We awoke on the final morning for our short sail back into port. It was time for farewells, Facebook adds and the walk back into town. With nearly 12 hours to kill before our coach we settled in for the long haul at the local pub. Definitely one of the downsides of backpacking is the endless hanging around, and despite efforts to kill time in the beach and with walks the shade and relative cool of the pub was our best bet. When finally the time came to head to the bus terminal (which is about a mile outside of town in the middle of nowhere) it was pitch black and soaking wet – the Australian weather was certainly casting a dampener on our adventures.